Jake Bleil, a senior at Rowland Hall in Salt Lake City, was named a semi-finalist. 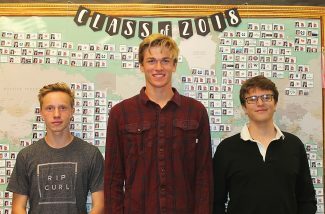 From left: Harrison Paas, Cameron Stevens and Dennis Rothwell were named National Merit Scholarship semi-finalists from Park City High School. 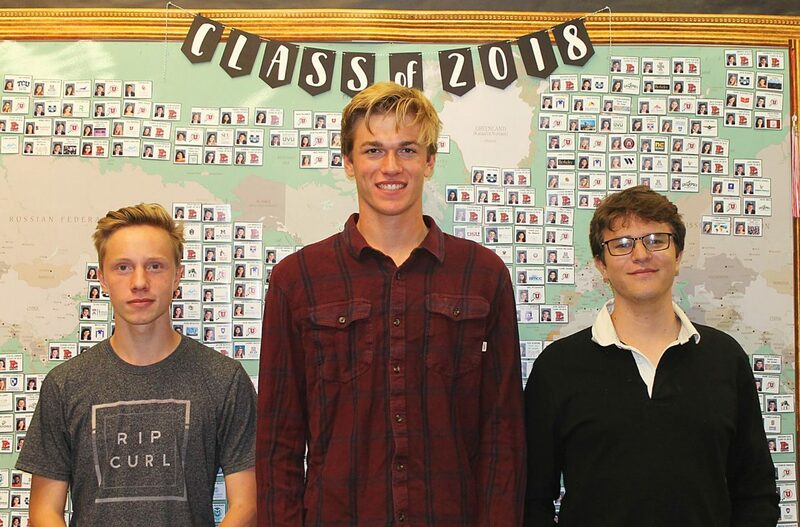 Harrison Paas and Cameron Stevens were sitting in Spanish class at Park City High School when they first caught a glimpse of their PSAT scores. They wasted no time in getting online to see if they made the cut to be named National Merit Scholars. They were confident they had some of the top scores in the state, but they waited the next few months for confirmation. Finally, they got the news that they were National Merit Scholarship semi-finalists. 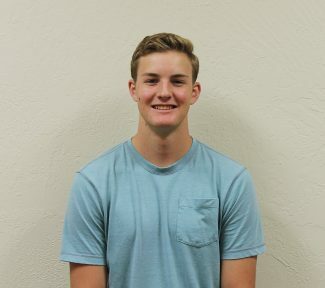 Paas and Stevens were two of six Park City students selected as semi-finalists for the national honor. Dennis Rothwell, who recently moved to Park City from Kansas, was the third recipient from Park City High School. 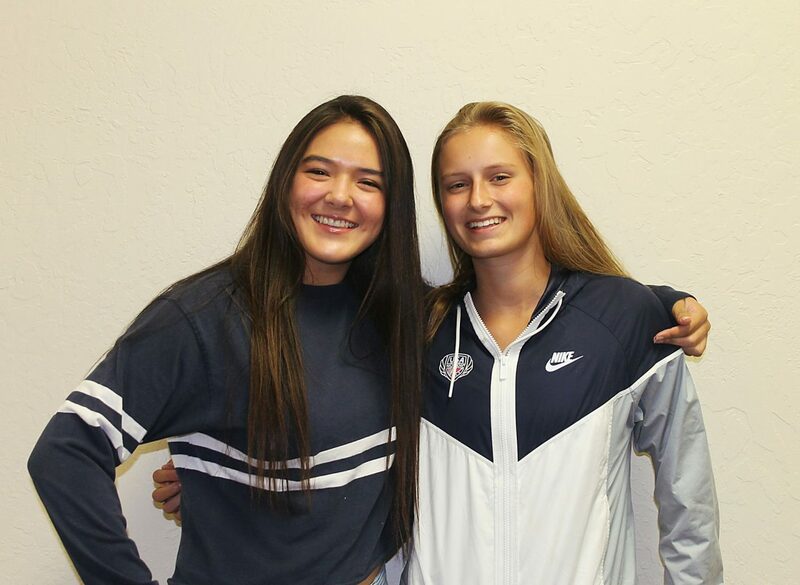 Maxine Dalton and Samantha Macuga from the Winter Sports School and Jake Bleil, who attends Rowland Hall in Salt Lake City, were the other recipients. About 200 students in Utah were named semi-finalists for the scholarship after receiving top marks on their PSAT. A total of 16,000 seniors out of 1.6 million students who took the exam last fall were selected across the country for the honor, and they will now compete to be one of 7,500 students awarded scholarships in the spring. The six students said school has always been a priority for them and something they have excelled at. Still, they felt surprised and proud to receive the honor. For Macuga, the announcement helped her realize that she is on the right track for her future. "Getting recognized for it, it feels very satisfying because I left the regular high school to go to the Winter Sports School to pursue sports, and a lot of people think that is giving up education, but I like learning things in school and I am really invested in it," she said. "It was affirmation that it's been worth it." When she thinks about the numbers, Macuga said she is even more shocked to know that she was one of only 16,000 students around the country selected. As the seniors prepare to submit applications to colleges and other scholarships, the recognition helps set them up for success and, Bleil said, sets them apart from others. He also appreciated the congratulations from teachers and students, since he said the test was an accumulation of years of hard work. Getting recognized for that was nice, he said. Now, the semi-finalists must submit an application and essay to potentially be named a finalist. The list of finalists will be announced in February. In the spring, scholarship winners will be announced. Stevens said he is eager to see how far he can go in the process, since he took the PSAT with the hopes of receiving a National Merit Scholarship. Some of the schools he is looking to attend provide half- or full-tuition scholarships for National Merit Scholars. But regardless, he said making it through the first round is a big step that he is happy to accept. "It's a really cool honor and something that follows you for the rest of your life," Stevens said.